Danaides, by John William Waterhouse. Like it? Go and see more. 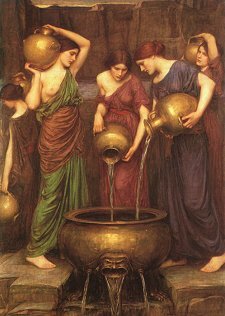 Other images on this site by John William Waterhouse include Danaids, Destiny, Danae, Daphne, Calypso, Ariadne, Adonis, Thisbe, Pandora, Medea, Circe, Lamia, Siren, Penelope, A Naiad, Psyche, Hylas and the Nymphs, Psyche Entering the Garden, and Echo and Narcissus. Read more about the Danaides.